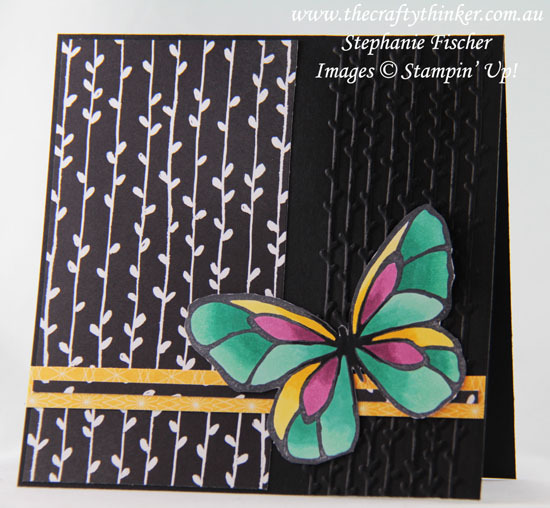 The butterfly started out life as an in-class demonstration of Stampin' Blends alcohol markers and then found its natural habitat on this card! The black & white background provides the perfect showcase for the colourful butterfly. A multipurpose card! The Petal Passion Designer Series Paper is paired with the use of the coordinating Petal Pair Textured Impressions Embossing Folder. I added a small strip of Daffodil Delight paper from the Birthday Memories Designer Series Paper pack to which I adhered a tiny strip of the black and white paper that I'd trimmed off - waste not, want not!